Yes, I am. You might not know this, but other than our telltale last name, we also share disproportionately short eyebrows, webby feet and gap teeth. Although applying to Yale-NUS was a decision made out of my own volition, I have realized over the course of my first semester that while both my brother and I attend Yale-NUS, I will always be inextricably linked to him. And although living in a residential college with your kin comes with its own benefits and drawbacks, this is not a situation unique to my brother and I. This is an experience that I share with more than eight other sibling pairs in the school. How did your older sibling’s presence in Yale-NUS influence your decision to apply? Bing Pei: Even before I came here, she would always tell me about how different Yale-NUS was from the mainstream education in Singapore. Her experiences in school were aligned with what I was seeking, so naturally, knowing and trusting someone who was getting all these first hand experiences with the pedagogy and culture of school made me more inclined to apply to Yale-NUS. 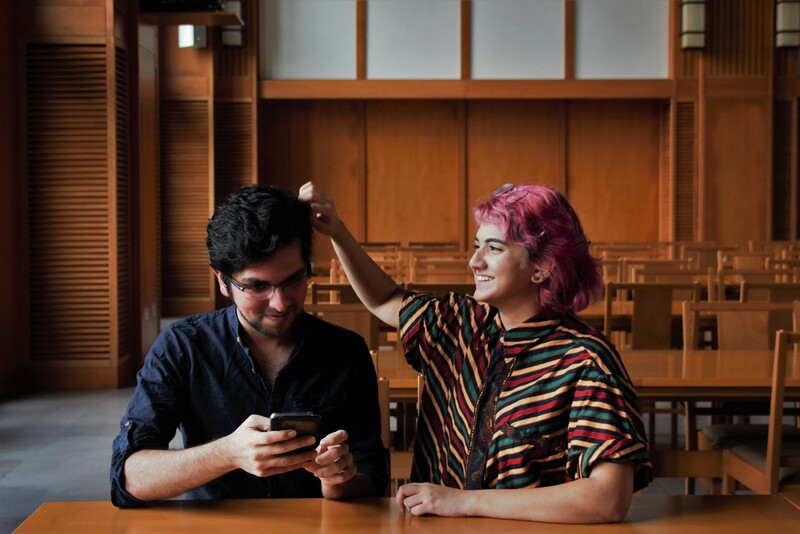 What role do you hope to play in the sibling dynamic at Yale-NUS? Bing Lin: I hope to give my younger sister as much independence as I can, to let her learn and find herself in these formative college years through her own experiences and just be around if she needs anything. Bing Pei: Just going to be here whenever she needs people to handle mundane stuff like stapling her assignment and having my closet forever open for her to borrow my clothes whenever she needs. How do you deal with other students realizing that you’re siblings? Do you take it in stride or try to keep a low profile? Bing Lin: It’s hard to keep a low profile because we apparently look, talk and behave the same. We just take it in our stride, but I do sometimes wish that the fact that I have a younger sister in school is not a starting point for conversation. Bing Pei: Of course I take it in my stride! She’s truly amazing and I couldn’t be more proud to be known as her sister! Also, since we both go by ‘Bing’, it just makes things funnier when we have friends in common and it’s always easier to strike a conversation with upperclassmen who recognize me as her sister. When you learnt your younger sibling was matriculating, what was your first reaction? Bing Lin: WEW! My hard work guiding her through the application process and personal statements paid off! 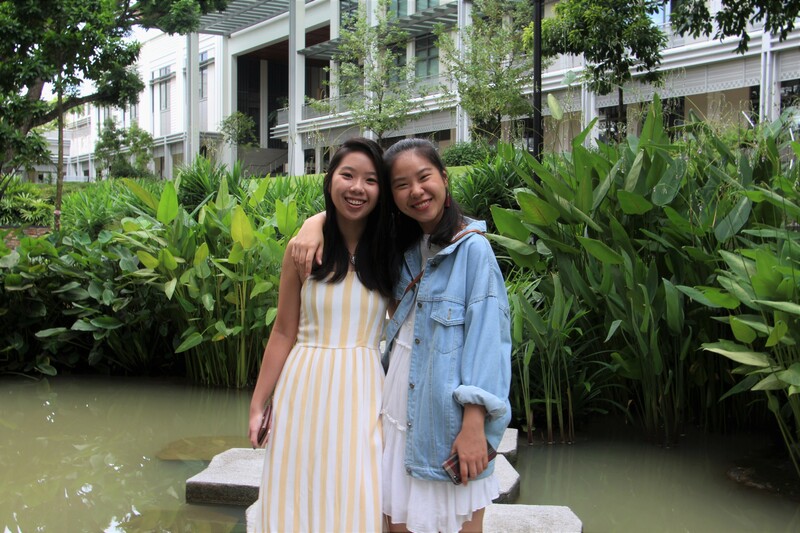 But more seriously, I was happy for her because I knew that Yale-NUS is best suited for her in terms of pedagogical style, especially because I saw her being frustrated with the mainstream Singapore style of education and really wanted her to have a different schooling experience. Has there been a time when you regretted choosing the same school? Bing Pei: No, I’ve never regretted my decision, because she’s going to leave the school in one year’s time! I’m kidding. But really, I’ve never regretted it once because Yale-NUS is my dream school and having a dependable sibling here just makes it extra dreamy. What was your greatest concern about having a sibling in the same college? Sharan: My brother and I are very different people. A big concern for me was that a lot of people would expect me to be my brother when they talked to me and be disappointed when they realized how different we really are. Roshan: To be honest? I was more concerned for her than I was for me. One of the greatest things college offered me was the chance to chart out a whole new course for my life, where I felt like I could be anyone I wanted to be. I was worried that my being around would present this unwelcome sense of continuity to the experience, and rob it of some of that ‘fresh start’ feeling. In hindsight, I vastly underestimated Sharan’s force of will, and her dedication to doing whatever the hell she wants. Sharan: My brother inspires me a lot. One great thing that has come out of being in the same school is that I’ll pitch an idea to him and he’ll throw at me a detailed breakdown of the various ways the school can help me execute my ideas, whether anything like that has been done before, and how the upperclassmen in the school would react to it. I just expected him to say “cool” or something. Roshan: I remember one day we were out for a meal with the rest of our family, Sharan turned to me and said “I finally understand you in relation to this place.” I asked her, “Anything in particular?” To which she responded, “Everything. It all makes sense now.” So I suppose you could say it’s given us the highly specific, odd little life experience that we’re toughing out together, and that’s been pretty special. Sharan: Hell yes, I don’t know what I’d do without our gossip sessions. He gives me really sound advice whenever I feel overwhelmed and contextualizes a lot of the problems I’ve faced within Yale-NUS. Roshan: Ha! Haha, oh, man. Um, no, we don’t really schedule time. I think I may have overcompensated for wanting Sharan to chart her own course here, and given her a bit too much independence. While I haven’t been avoiding her by any means, we could definitely afford to meet up more. When we do, it’s usually for a meal, where she’ll meet a friend of mine, or I’ll meet a friend of hers — rarely alone, now that I think about it. What role do you hope to play in your sibling dynamic at Yale-NUS? Sharan: I support him as much as I can! He’s always out working on at least three things at a time and it honestly makes me so proud. I attend all of his plays, and if I can support him by buying him some food when I know he hasn’t eaten in 24 hours, I try to do that. Roshan: I expected to be giving her a lot more advice than she has wound up needing. Still, I’m hoping to be a constant resource for her — someone she can reliably tap on if ever and whenever she needs it, without feeling like she’s obliged to do so. I hope she can feel like no matter what happens here, she will always have someone on her side no matter what. Sharan: The fact that I had a sibling in the school was a deterrent for me. Not because of any reason related to my brother, but because I thought that it would make forming my own identity that much harder. However, as of right now, I’m glad to have him around. How has your relationship changed since Sharan matriculated? Sharan: I feel like I understand him a lot better. I understand his crazy sleep schedule and why he’s so insanely busy all the time because literally every student here is. Being in the same school as him has let me contextualize him better. Roshan: I think it’s been wonderful getting to know her in her element. It’s not that I ever necessarily saw Sharan as a ‘kid’, but going to the same college — to the same events — has definitely given me a new perspective into just how mature and adult-like she is. It’s hard to call her my ‘little sister’ with a straight face, at this point — there are many days where I feel I’ve got more to learn from her than the other way around.